On Wednesday, the Horticultural Society held their third and last Exhibition for the season, at the Gardens at Chiswick. Several circumstances combined to render this, by many degrees, the most brilliant fete of the season. The weather on the two previous Exhibition days was unfavourable: they were "wet Saturdays "—by no means rare in the Society's calendar; one would have thought them dedicated to Jupiter Pluvius. Wednesday was, however, a glorious day for any al fresco fete: the sun shone throughout the morning; in short, it was a day of undimmed splendour. Again, 'this third and last fete had a goodly balance of company from the two "wet Saturdays," who preferred reserving their tickets (good "for either of the three meetings"), to chancing it between the showers. Added to this, was the attraction of the grounds of Chiswick House being thrown open, as on the last day of exhibition in former years, by the Society's noble and liberal neighbour, the Duke of Devonshire. We have heard it stated that nearly 14,000 tickets were disposed of; and it was computed that 12,000 persons were, at one period of the day, present in the Gardens. The exhibition of fruit and flowers, although the specimens were not very numerous, was an excellent one. The orchids were numerous, and so, of course, were the heaths. There were brilliant groups of pelargoniums, roses, and geraniums; and among the cut flowers, carnations, pinks, and picotees attracted the largest groups of admiring spectators. Of the fruits the finest and most numerous were the pines, some of which were unusually large and well shaped; the collection of other fruits was neither so extensive nor varied as at former exhibitions. The details of the fete were admirably managed. 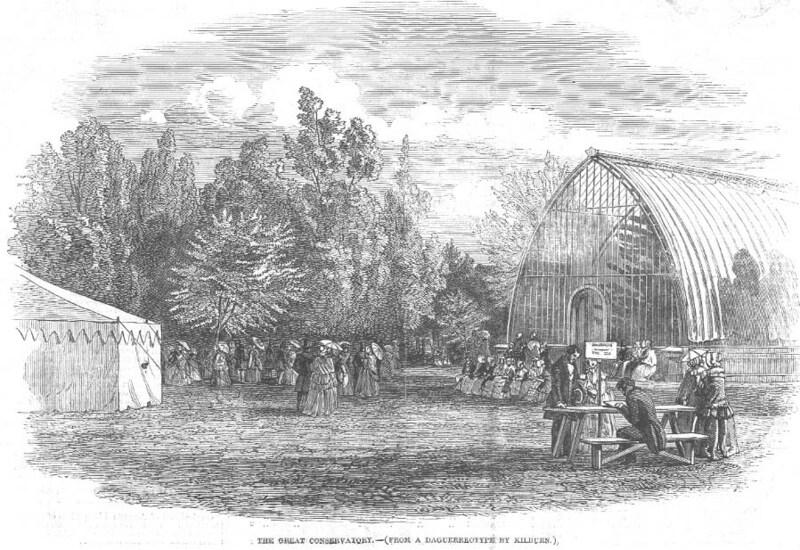 The tents were crowded during the greater part of the day, yet there was no confusion or inconvenience; and, although the demand for refreshments sometimes exceeded the power of immediate supply, the exercise of a little patience on the part of the applicants was all that was found requisite. There were four military bands in attendance—the Coldstream, the Grenadiers, the Horse Guards, and the Life Guards, which were stationed. in various parts of the grounds, and played, during the day, several favourite overtures and airs. At half-past three they all assembled in the Duke of Devonshire's grounds in front of the villa—his Grace having kindly thrown open his splendid gardens and conservatories to the visitors here they performed Vincent Wallace's new National Anthem, and the grand march in the "Midsummer Night's Dream;" and the effect of these exquisite and finely-contrasted pieces, as interpreted by nearly two hundred of our leading musicians, was extremely fine, and elicited general marks of approval from the auditory. The scene here was extremely picturesque and animated. Groups of elegantly attired ladies were either seated, or promenaded in the shrubberies; while some of the juveniles were afforded the enjoyment of swinging in the hammock and other swings fixed on the lawn. Altogether this was one of the most brilliant horticultural fetes that has been given for some years. The company included nearly all the rank and fashion of the metropolis, evidently glad to escape from the Babel of bricks and mortar. We append a pair of pictures from this great Chiswick Meeting, from Daguerreotypes, ably executed by Mr. W. E. Kilburn, 234, Regent-street. In the first scene we have three of the bands performing in the Gardens [180K], near the Rhododendron Circle; and in the second picture [see top] we have the Great Conservatory, and a small portion of the chief Tent.